Boosting a head full of long, lustrous and voluminous hair is a commitment that comes with a great many challenges. The longer the length of your hair, the greater the time you need to allocate for maintenance, hair care, shampooing, styling and even brushing. You need to create a regime and schedule it around various hair care techniques, conditioning treatments, natural hair packs and those regular trimming sessions that are essential to make your hair look fresh and healthy. Despite all the trouble that long hair put us through, flaunting a lustrous and luxurious mane of glossy strands comes with a lot of pride and confidence. Needless to say, voluminous hair are the very sign of excellent health that we notice about a person, and when your hair is glossy, thick and shiny, you feel little need for ornamentation, accessorizing or cosmetics. However, keep in mind that there is no easy one-fits-all solution to growing a thick and shiny mane, and if you want to boost your hair growth and fight off all those awful hair loss symptoms, you need to alter your diet and provide your hair and scalp the nutrition they require to grow strong and healthy. This nutrition will come in the form of whole foods and essential nutrients that pack up powerful hair nurturing capabilities. In this article, we will walk you through all the various foods, vitamins, minerals and nutrients that protect our hair, make them thick and shiny along with encouraging speedy hair growth. This savoury leafy green veggie is loaded with countless nutrients that improve the health of the scalp and boost hair growth, including folate, iron and heaps of nourishing antioxidants. 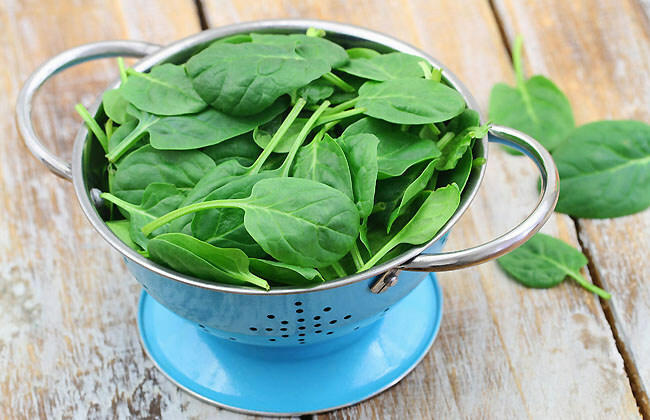 All you need is a medium serving of spinach leaves added to your daily salad, smoothie, casseroles, or even a hot bowl of soup, and it will help you feel energized, along with enhancing the growth of your hair. For most effective results, create a spinach smoothie with some lemon juice as the vitamin C will aid your body in readily absorbing iron and utilizing its benefits.